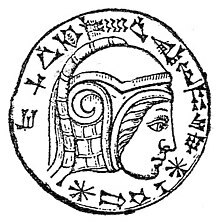 Nebuchadnezzar II ( i/nɛbjᵿkədˈnɛzər/; Aramaic: ܢܵܒܘܼ ܟܘܼܕܘܼܪܝܼ ܐܘܼܨܘܼܪ‎; Ebreu: נְבוּכַדְנֶצַּר‬ Nəḇūḵaḏneṣṣar; Ancient Greek: Ναβουχοδονόσωρ Naboukhodonósôr; Arabic: نِبُوخَذنِصَّر nibūḫaḏniṣṣar; c 634 – 562 BC) wis keeng o the Neo-Babylonian Empire, who reigned c. 605 BC – 562 BC. He is creditit wi the construction o the Hangin Gairdens o Babylon an for the destruction o the First Temple. He is featurt in the Beuk o Daniel an is mentioned in several ither beuks o the Beeble. This page wis last eeditit on 16 Mairch 2014, at 13:05.